Vegan carrot cake cinnamon rolls featuring a carrot cake dough, buttery brown sugar cinnamon filling adorned with walnuts and raisins, topped with a creamy vegan cream cheese frosting. This recipe is about to score you some major cool points for your next brunch or breakfast! I may have just broken the internet with this one right here! Like holy crap, I think this is my new favorite thing EVER. Carrot cake is my favorite cake, always has been. And as a child, Cinnabon had my heart. I think I would have been FB official with Cinnabon if that were a thing in the 90s. 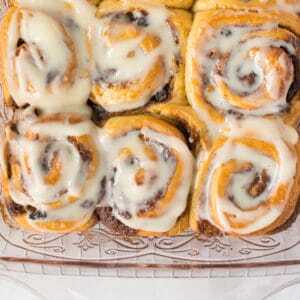 Naturally, I had to combine my two favorite loves to make these super delicious carrot cake cinnamon rolls. Believe it or not, cinnamon rolls are super easy to veganize because the core ingredients are already vegan! 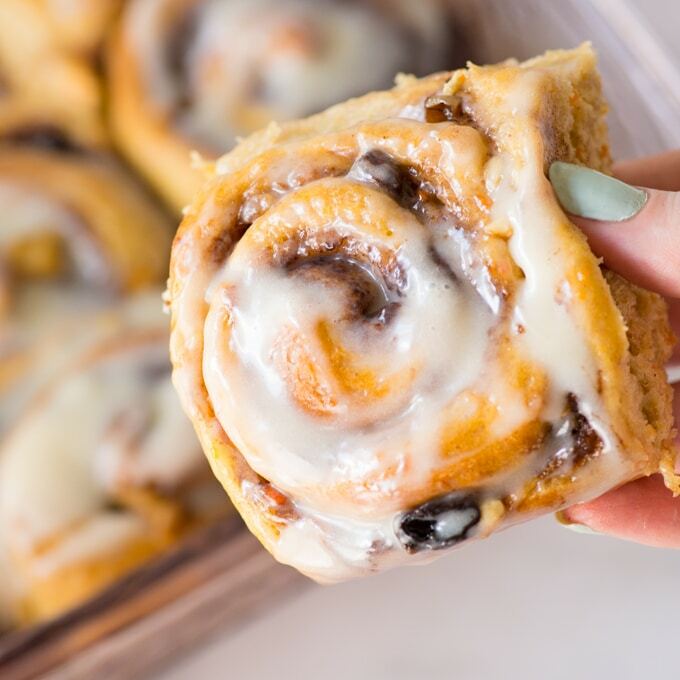 Luckily, there are some pretty great substitutes out there for butter and cream cheese to make these vegan cinnamon rolls taste like the real deal. If you head for the hills when you see a recipe with yeast, just know you are not alone! 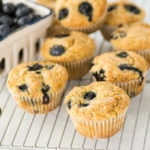 I researched and tested the heck outta this recipe to provide you with the most intuitive recipe! Not going to lie, cinnamon rolls require some steps, but they are easy to make! Microwave almond milk for about 40 seconds. It should be lukewarm. Not hot! Too hot will kill your yeast. Add a pinch of sugar as this helps to wake up the yeast. Not required, but helps the process. Add one yeast packet and give it a mix. Now let sit for 10 minutes. The end results should be bubbly and frothy like the image above. If it is not, give it some more time. If it still looks like nothing. The yeast is probably dead and you need to try again. Do not move on with the recipe if you have inactive yeast! 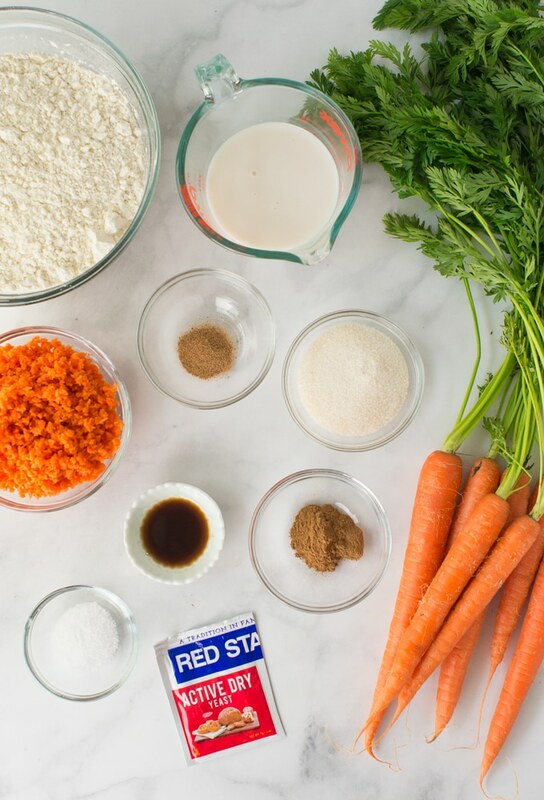 Add the carrots, melted butter, vanilla, and yeast bath into a mixing bowl and give it a good stir. In a separate bowl, add all the dry ingredients and add the dry to wet. Mix with a rubber spatula until just stirred. The mixture might look pretty floury but that’s okay! Dump it on a lightly floured surface and knead the dough for 10-15 minutes! Don’t skimp on the kneading time. It’s pretty therapeutic anyways! 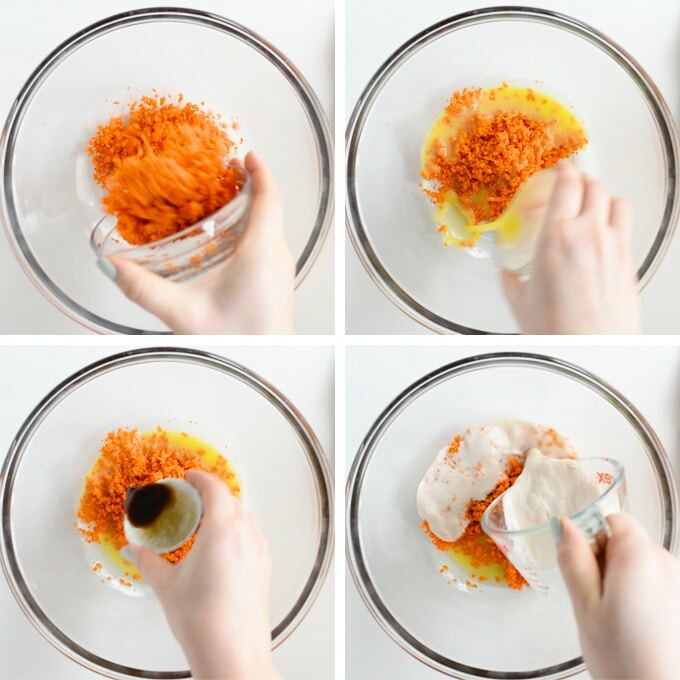 Once your kneaded dough is a nice ball, place in a clean bowl that is coated with a bit of oil. Place plastic wrap over the top and let rise for at least an hour. It should double in size. Make sure the yeast is alive and active before moving on with the recipe. Inactive yeast will not make your cinnamon buns rise! Mix the wet ingredients generously and whisk the dry ones thoroughly as well. But when the dry gets added to the wet, don’t over mix! My dough looked pretty floury, but I dumped it onto the table and with a little kneading, it looked great. When kneading the dough, only add more flour if the dough begins sticking to the surface or your hands. 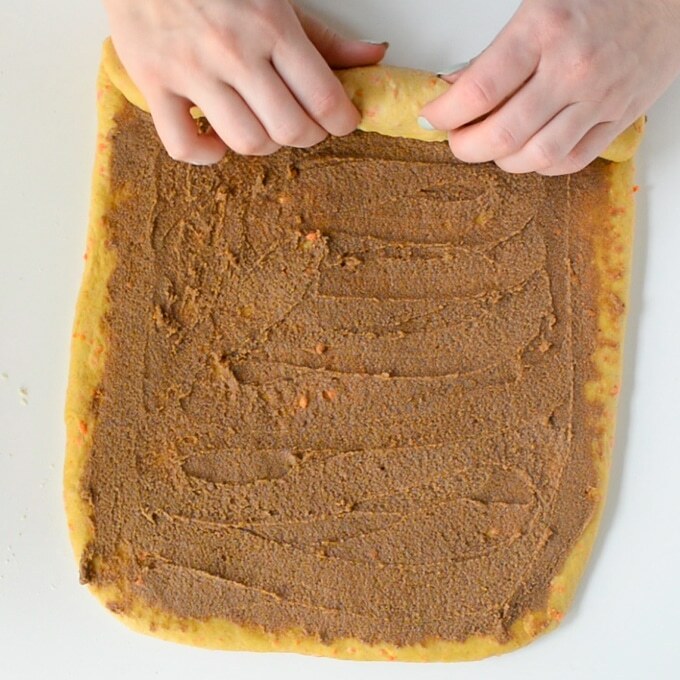 You want the dough to be slightly sticky to the touch, but not so sticky that it’s all over your hands! You know the dough is kneaded enough when you press it and the dough slightly bounces back. When the dough is rising, this is the perfect time to make the cinnamon filling! I use to brush melted butter on with a pastry brush and sprinkle the sugar and cinnamon on top. But after watching a Tasty cinnamon roll video, mixing softened butter with cinnamon is GENIUS. This technique ensures every nook and cranny have the same amount of cinnamon, sugar, and butter. Add the filling and spread with a rubber spatula. Be sure to roll it tightly as this will create that beautiful swirl. You can push in the ends as you roll to make sure you have a uniformly sized log. Now here we use dental floss to cut the dough. This works far better than a knife as it doesn’t squish the dough. You should have about 12 rolls. Okay, THIS STEP RIGHT HERE is an important one! It’s called the second rise. The photo on the left is right after cutting, the image on the right is 45 minutes later. Those are still uncooked but they had a second proof. If you skimp on this step, your rolls will not be big and fluffy. We like big and fluffy. We want big and fluffy. So proof your rolls, girl! 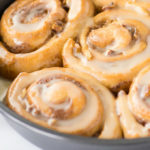 If you want to make these vegan cinnamon rolls in advance, nows a good time to cover and let sit in the fridge overnight or even put in the freezer for when you’re ready to bake! Simply whisk all vegan cream cheese ( I like Daiya or Kite Hill), powdered sugar, vanilla, and melted butter together. Add a small about of almond milk until a nice icing consistency is reached. Adjust the powdered sugar or butter if you want it thicker, add more almond milk to thin out. 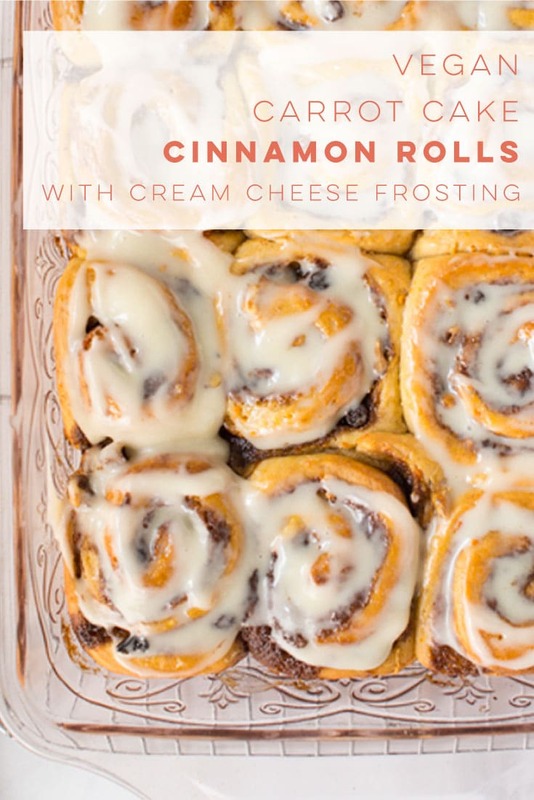 Once the rolls are out of the oven and cooled, add some frosting and DEVOUR! 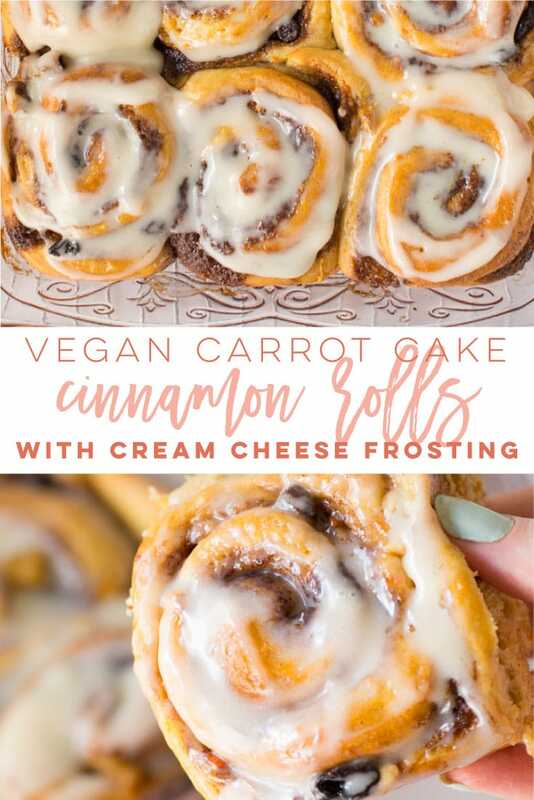 These vegan carrot cake cinnamon rolls are perfect for Easter, Mother’s Day, birthdays, baby showers, brunch, or just any ol’ breakfast! Heck, breakfast lunch and dinner if you ask me! Carrot cake is not for just cake no more! These cinnamon rolls are here to stay! And I’m totally okay with that. 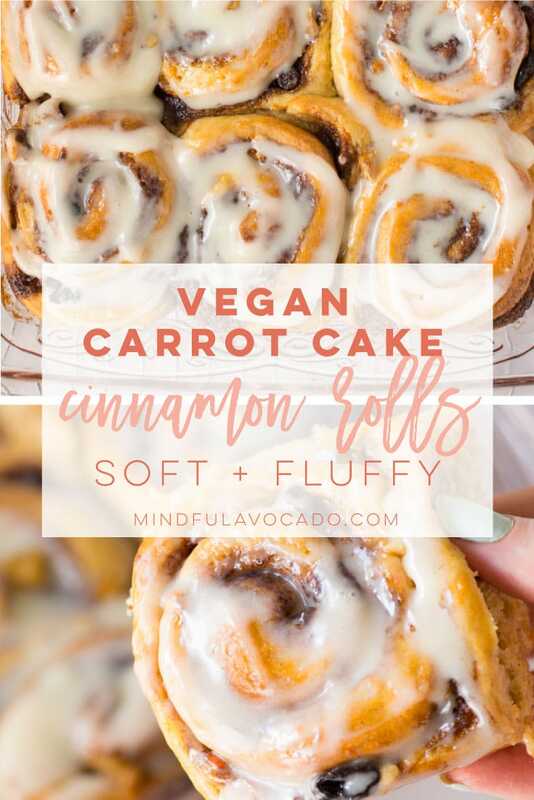 If you tried this vegan cinnamon roll recipe, let me know in the comments below and share a photo using #mindfulavocado. I’d love to hear from you! Want to see more recipes? Let’s get social! CONNECT WITH ME on Facebook, Twitter, Instagram, or Pinterest to see what I’m currently cooking up! 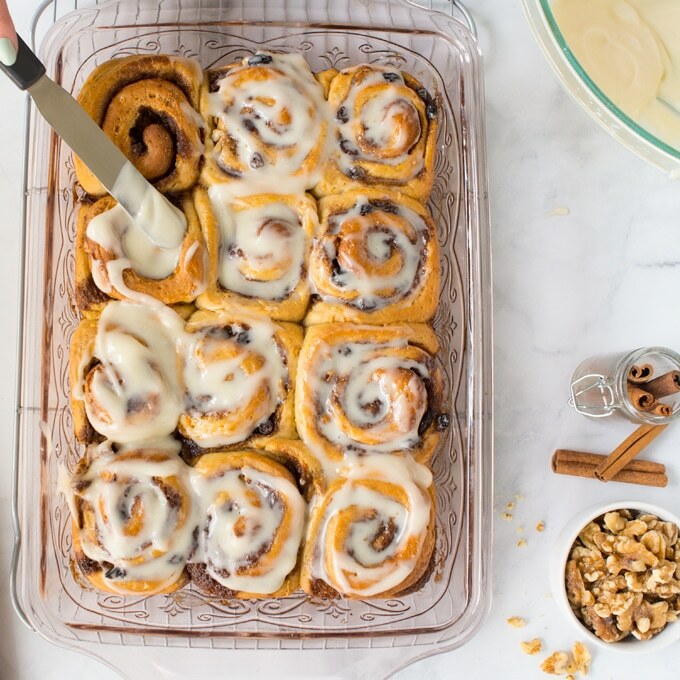 Homemade cinnamon rolls featuring a carrot cake dough, buttery brown sugar cinnamon filling adorned with walnuts and raisins, topped with a creamy vegan cream cheese frosting. Let them rise overnight for an easy breakfast the next morning. Perfect for and special occasion or brunch! dental floss for cutting dough. Can use serrated knife instead. Wake up yeast: Microwave almond milk for about 40 seconds. Should be lukewarm. Add a pinch of sugar and one yeast package. Mix until combined and let sit for 10 minutes. Yeast will be bubbly and frothy when ready. 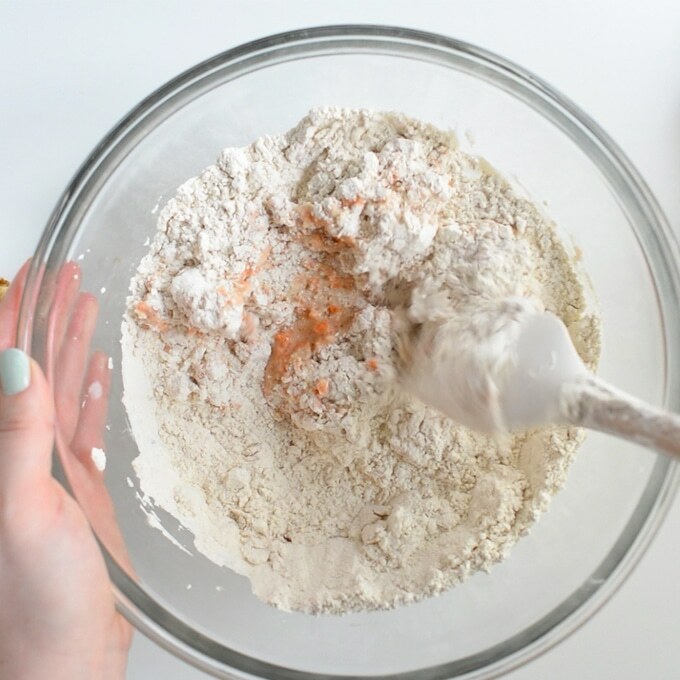 In a large mixing bowl, add carrots, vanilla, butter, and active yeast bath. Stir to combine. In a separate mixing bowl, whisk together flour, sugar, salt, cinnamon, and nutmeg. Add half of the flour mixture to wet mixture and stir with rubber spatula. Add the remaining flour and stir until just combined. The dough might look floury and that is okay! Transfer dough to a lightly floured surface and knead for 10-15 minutes. 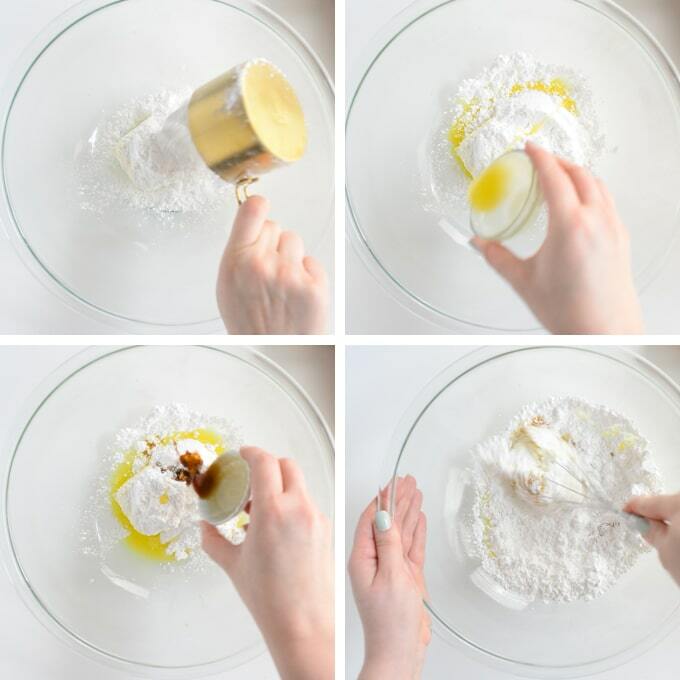 Only add more flour if the dough begins to stick to the surface or your hands. When the dough is ready, it will be slightly sticky and spring back when you press it. Add a small amount of oil to a clean bowl to coat the bottom and sides. Add dough and give it a swirl around the bowl so all sides are covered in oil. Cover the bowl with plastic wrap and let rise for 1 hour. The dough should double in size. In a small bowl, mix softened butter, sugar, cinnamon, nutmeg, and salt. 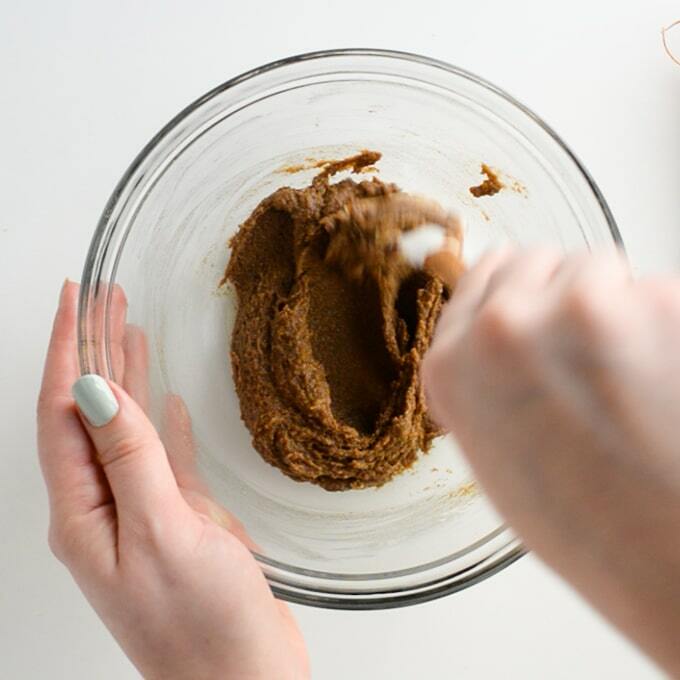 Mixture should be smooth and spreadable. 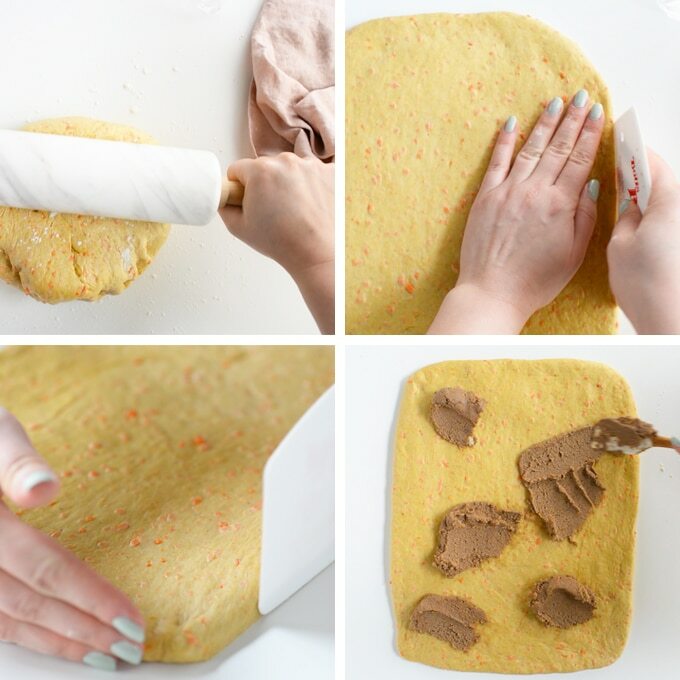 Remove plastic wrap and punch dough to release the air. Transfer to a floured surface and roll into a 9x13" rectangle. The dough will be about 1/2 inch thick. Add filling and smooth out with a rubber spatula. Add walnuts and raisins (optional). Roll tightly starting from the shorter side. Push in the sides as you roll so it stays uniform. 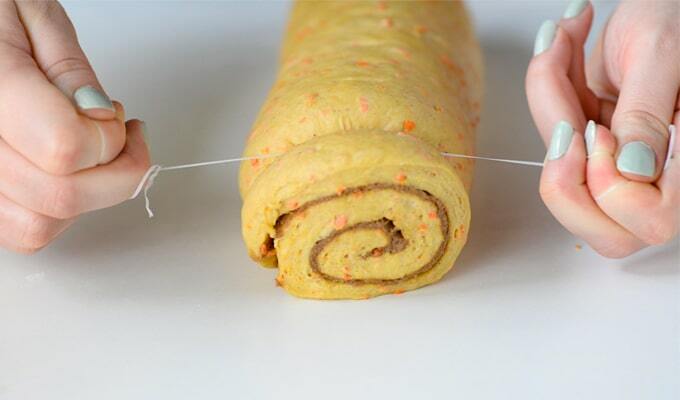 Using dental floss, cut the dough into 12 even pieces. Place in greased pan. I grease my pan with the empty butter wrapper! Cover with a towel and let sit for 45 minutes. If you want to make these rolls in advance, now is a good step to stop. You can keep unbaked rolls covered in the fridge overnight or in the freezer for 6 weeks. Bake for 30-35 minutes. Remove from oven and let cool before adding icing. Whisk together all the ingredients for icing in a bowl. Add more powdered sugar or butter for a thicker frosting and more almond milk for a thinner icing. 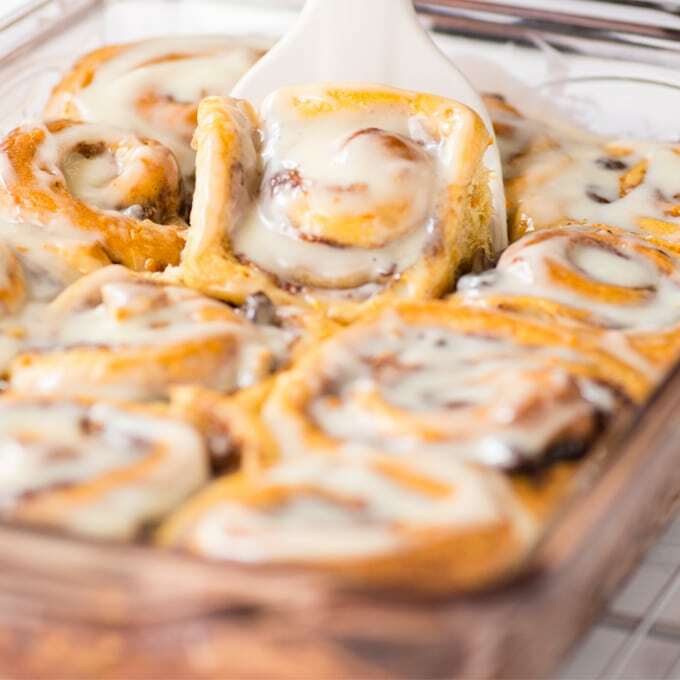 Add icing to cinnamon rolls. Serve warm. Leftovers keep in the fridge for about 1 week. Vegan Chai Cinnamon Rolls + VIDEO! Would this recipe work the same if the dough was made in a bread machine using the same ingredients? I haven’t tried it, but it definitely should! Just make sure to use the dough hook attachment. Two yummy dishes combined – I love it! I’m a fan of carrot cake and cinnamon rolls (who isn’t?! ), and I love that you’re combining them together in this recipe! These wouldn’t last long in my house. Yum! This sounds like my dream dessert! Or dream breakfast? Or both!!!! I’m def making these soon!!!! I say both! haha. Thanks, Catherine! You had me at pillowy soft. Pinning for the weekend! These sound ABSOLUTELY DELICIOUS! 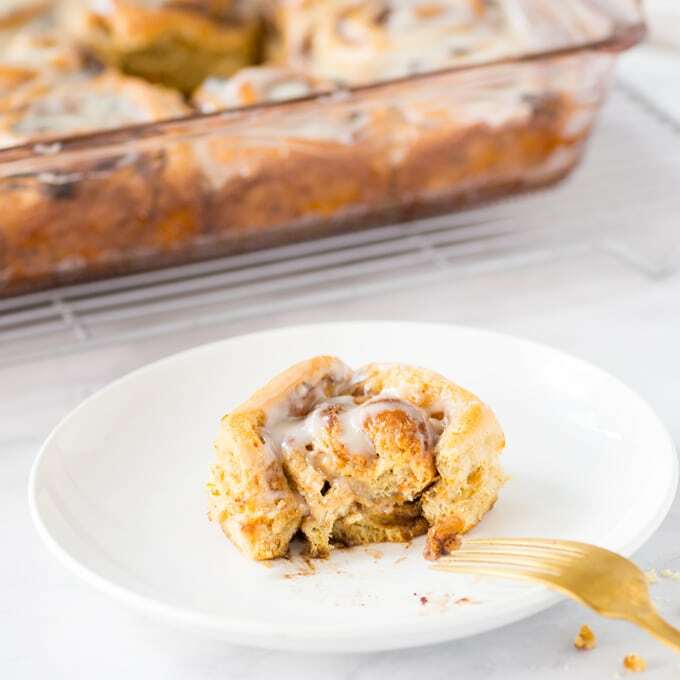 It’s not often that I have the patience to make cinnamon rolls for breakfast, but when they’re an amazing combination of carrot cake and cinnamon rolls… That can definitely have me convinced to give them a try. Plus, your step by step photographs are so handy! Thanks Erin! I think the combo is def worth a try! These rolls looks amazing! I’ve always done the dental-floss-cut with my rolls as well, and when my kids were toddlers, they would watch me cut them and laugh their heads off every time a roll magically fell off the long roll. Carrot cake and cinnamon rolls together?! Genius! Yess! I’d like to think so! These look amazing! I am going to try to substitute gluten free one for one, but was wondering if you had tried to make them gluten free. If so what worked best? I have not Karen! But I do love Bob’s Red Mill 1-1 GF flour! If you try, I’d love to hear how it turns out!